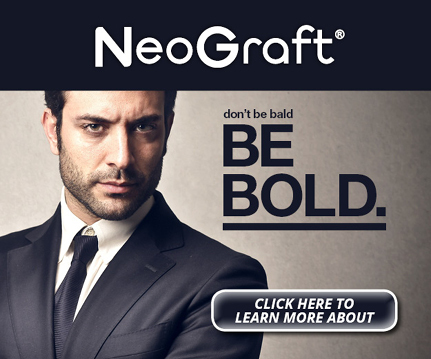 NeoGraft is the latest advancement in hair transplant technology. This system is a minimally-invasive solution which can treat male and female pattern baldness. NeoGraft’s Follicular Unit Extraction method facilitates the proper harvesting of follicles from the donor site, dramatically improving the accuracy and speed over previously used manual extraction instruments. This extraction process leaves little to no scar when compared to the traditional “strip method.” After extraction, hairs are re-inserted in the treatment area using the latest techniques in hairline design to ensure a natural looking transplant. NeoGraft has a faster recovery time, a more natural-looking result, and less risk of complication than any other surgical option. NeoGraft is safe, comfortable, discrete, effective, and affordable. This treatment does require 48 hours of downtime; however, with a 92-98% take rate, your hairline should be permanently revived within 6 to 9 months. Hair transplants / NeoGraft™ System is a new automated hair transplant system which is the latest advance in hair transplant technology. This system facilitates the harvesting of follicles during a Follicular Unit Extraction (FUE) hair transplant, dramatically improving the accuracy and speed over previously used manual extraction instruments. Neograft is a minimally-invasive procedure with a fast recovery time of any surgical option and a natural-looking result. The facts are that 40 million men and approximately 21 million women, suffer from male/female pattern baldness or thinning hair. Many potential patients shy away from (or are not candidates for) the traditional “strip method” of hair replacement because of the slow recovery time, the loss of feeling at the incision site, the tiny linear scar on the back of the head, or the amount of post-operative pain involved. The “minimally invasive” NeoGraft™ Automated (FUE) and Implantation Hair Restoration procedure is quickly becoming the new “Gold Standard” for hair transplant procedures. There are several methods used in doing hair transplants. The “strip” method or FUT (follicular unit transplantation) is the most commonly performed method. The FUE (follicular unit extraction) method, a minimally invasive method of hair transplantation introduced in the late ninety’s and the automated FUE method, the newest most advanced method of hair transplantation available today.